Isn’t it amazing how quickly something can go from being an expedient method of accomplishing God’s will to being seen as the only method by which God’s will can be done? These methods quickly become tradition and – if we’re not careful – these traditions can become indistinguishable from doctrine. 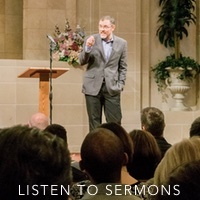 Sunday evening service has become one of these traditions that – to many Christians – has become indistinguishable from doctrine. Many are probably wondering, “What do you have against Sunday evening services, Wes?” Nothing. In fact, my only problem is that I wish we’d go all day. But whether you and I like Sunday evening services or not – whether we see the benefit or not – is irrelevant. What we need to recognize is that meeting for worship on the First Day of the week is the doctrinal matter (1 Corinthians 16:2; Acts 20:7), but the “service times” are not. Congregations have the freedom to decide – for themselves – what time to meet on Sundays. This is how Sunday evening worship began in the first place. Individual congregations decided they needed a second worship service in the evenings. However, as this tradition spread throughout congregations, many began to feel this was the only right way of doing things. Now, as congregations are starting to reexamine their meeting times, some brethren are getting their feathers ruffled, as if some principle of God’s word was being violated. If a congregation believes that one worship service at 3:00 is best, then let them do that with all their heart. If a congregation decides to worship in the morning and have fellowship and Bible studies in the evening, then let them do that with all their heart. And if a congregation decides to stick with the old “tried and true” method of a morning and an evening worship service, then let them do that with all their heart. Church Buildings – Assembling together is a doctrinal matter (Hebrews 10:25), but where we meet is not. Pews – Sitting during worship is not even a doctrinal matter, much less what we sit on. Song Books – Singing “psalms, hymns, and spiritual songs” is a doctrinal matter (Ephesians 5:19; Colossians 3:16), but where we read the words is not. Passing a Collection Plate – Taking up a collection is a doctrinal matter (1 Corinthians 16), but how we take it up is not. A Song Leader – Again, singing is a doctrinal matter (Ephesians 5:19), but having someone stand up front and lead us is not. A Sign that Says, “The Church of Christ” – Being a congregation that belongs to Jesus is a doctrinal matter (Romans 16:16), but having a sign out front that says those exact words is not. In fact, having a sign at all is not even a doctrinal matter. 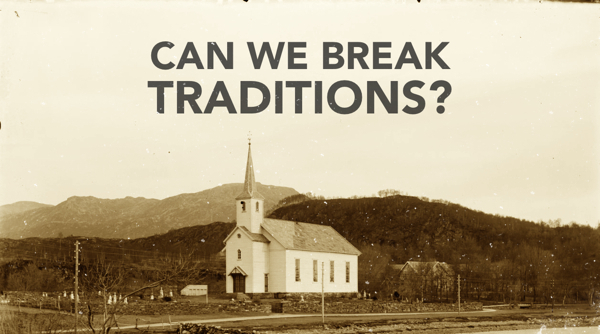 Shall We Break Our Traditions? Recognizing the difference between tradition and doctrine is vitally important. But just because we can break tradition, doesn’t mean we should. It probably became a tradition for a good reason. Just be sure to recognize it for what it is. Doing things in a traditional manner, does not necessarily mean a congregation is blindly following tradition. It is extremely condescending to treat everyone who does things traditionally as if they do not know how to think for themselves. And on the other hand, just because some break from the traditional way of doing things, does not necessarily mean they have left the faith. The goal is neither to be a traditionalist or an anti-traditionalist. The goal is to do things in a biblical and expedient way. God has told us things the church needs to be doing. In some of those things, He gave us the method in which to do them. In other things, He has left the method up to us. Just as He told Noah to use Gopher wood, but didn’t tell him what kind of hammer to use. We must be careful to honor God’s specificity and also honor the freedom our brethren have to choose when God has not been specific.